Microsoft released security updates for all versions of Microsoft Windows, Microsoft Office, and other company products on the October 2018 Patch Day. October has been quite the busy month for Microsoft so far. The company released the October 2018 Update for Windows 10 on October 2 but had to pause the distribution after user reports emerged that user files could be deleted during the upgrade to the new version. Microsoft addressed the issue, or part of it, in KB4464330 for Windows 10 version 1809 it seems. The company has not updated the KB article for Windows 10 version 1809 so it is possible that the issue is not fixed fully. The detailed overview provides system administrators and home users with information about released updates, known issues, links to support pages and other resources, and download instructions. Note: We recommend to create backups of any system that you want to install updates. While updates usually install fine, last year has shown that updates may break things or delete important apps or files. Microsoft released security updates for all client and server versions of Windows that it supports. The company released security updates for other products such as Internet Explorer, Microsoft Edge, Microsoft Exchange Server, and Microsoft Office. Windows 7 and Windows Server 2008 R2 PCs require the Servicing Stack Update 3177467 prior to installation of the October 2018 updates. Windows Server 2008 R2: 14 vulnerabilities of which 2 are critical and 12 are important. Windows Server 2012 R2: 15 vulnerabilities of which 2 are critical and 13 are important. Windows Server 2019: 19 vulnerabilities of which 3 are critical and 16 are important. Security updates to Internet Explorer, Windows Media Player, Microsoft Graphics Component, Windows Shell, Windows Kernel, Windows Datacenter Networking, Windows Storage and Filesystems, Microsoft Scripting Engine, and the Microsoft JET Database Engine . Remote Code Execution vulnerability in the Microsoft XML Core Services parser. Elevation of Privilege vulnerability in Filter Manager. Remove Code Execution vulnerability in Microsoft Graphics Components. Elevation of Privilege vulnerability in Windows Kernel. Information Disclosure Vulnerability in the Windows Graphics Device Interface. Elevation of Privilege vulnerability in the Win32k component. Remote Code Execution vulnerability in the Microsoft JET Database Engine. The installation of Windows Server 2019 Key Management Service host keys on Windows Server 2016 Key Management Service hosts does not work. Microsoft is working on a resolution. Network interface controller may stop working. Workarounds are to either install the driver for the network device or automatically rediscover it in the Device Manager. Files are not updated correctly if the update is installed without elevated privileges. Some services, Outlook Web Access or Exchange Control Panel, may stop working. To avoid or fix, right-click on the update and select "run as administrator". See our coverage of the update here. Fixed a Microsoft Intune issue. Check out our overview of non-security updates for Office that Microsoft released here. Below are only the security updates for Office released in October 2018. KB4461448 for Excel 2016 -- Fixes a remote code execution vulnerability in Excel 2016, a freeze issue when clicking on the Show Details command, and a Unicode IVS character display issue. KB4461437 for Office 2016 -- Fixes a remote code execution issue in Office, updates Irish Gaelic translation for OneNote 2016, fixes a non-recurring meeting turning into a recurring meeting issue, and addresses the Unicode issue described above as well. KB4461440 for Outlook 2016 -- Resolves several vulnerabilities in Outlook 2016 described in ADV180026. Includes a huge number of non-security improvements and fixes. KB4461434 for PowerPoint 2016 -- Fixes a remote code execution vulnerability in PowerPoint 2016. KB4461449 for Word 2016 -- Fixes a remote code execution vulnerability. All address a remote code execution vulnerability. The Outlook 2013 update includes other non-security changes. All address a remote code execution vulnerability. See other Office products with security updates here. The October 2018 updates for Windows and products integrated into Windows are made available via Windows Update and the Microsoft Update Catalog website for home users, and services such as WSUS for organizations and Enterprise customers. Windows Update is configured to run update checks regularly and to download and install these updates automatically. The checks are made frequently but not in real-time. Select the Windows Update result. Click on "check for updates" to run the check. Thanks, Martin for your 2018-10-09 – M.s.® Windows security updates October 2018 release overview and explanations of what is offered this month. Personly when I was updating from version 1803 release 13134.285 to the version 1803. release 17134.345 the first incoming update Kb4462919 directly (without downloading and installing the other updates like KB890830, KB 4462930 and others) tried to implement himself and restart the system. By doing so the update did not take and the system restored himself tot main previous version 1803 release 13134.285. My second update attempt did go much better and al main seven new updates were picked up by main system downloaded and implement. Why do I feel so INSECURE about Microsoft updates of any kind? I think it’s time for another full backup. Anybody knows when Microsoft is expecting to fix “Action Center” bug introduced in version 1803? WPD has been bumped-up to version 1.2.940. 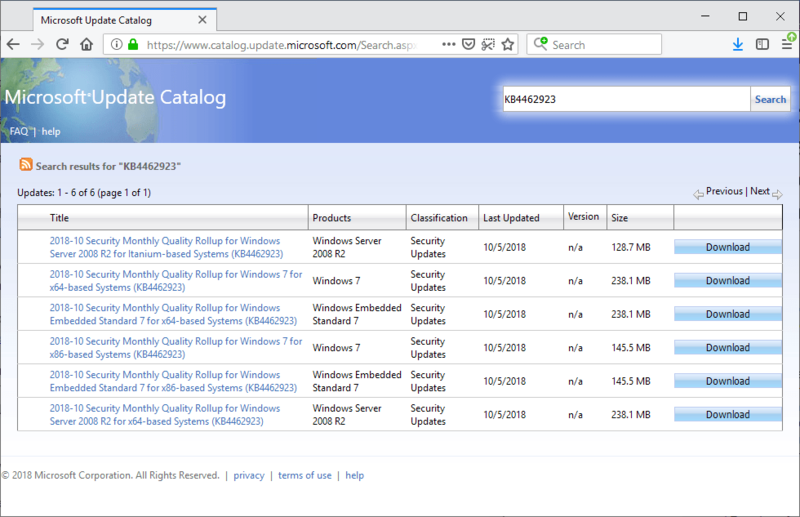 The total package for Windows 8.1 x64 is 150MB according to the MS Catalog site https://www.catalog.update.microsoft.com/Search.aspx?q=KB4459924. Thanks a lot for the excellent summary !!! in SCCM, what product category do select to see the .NET updates for Windows Server 2016?